How Can I Manage My Events Categories? You can control who has access to the Events in a category by adding specific permissions in your category. These permissions can be set per Event category, based on jobs and your academy’s organizational structure. Simply put, you are able to create rules per user’s job in each category. 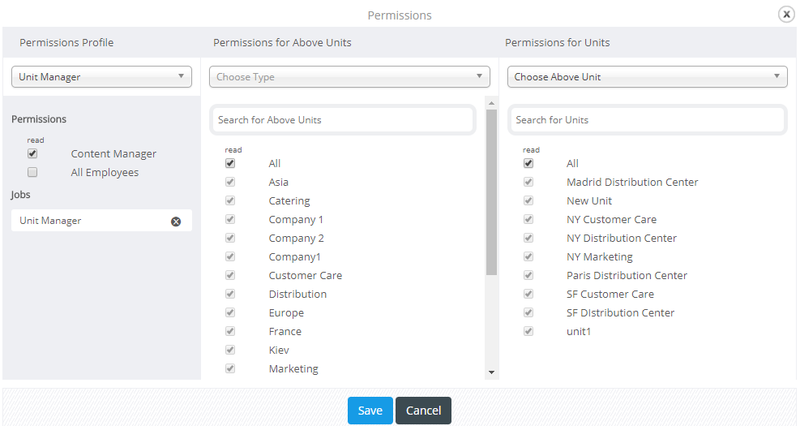 Give the permissions you want to Content Managers or All Employees by selecting your options under the Permissions Profile. You can also choose a specific job and give permissions to ALL units, above units or just to desired units. Finally, save to update the category! * A category now presents the events of all its subcategories. * If you delete a category, all events included will be listed in the "Without Category" section under Categories. * If you delete a subcategory, all events included will be listed in the parent category. How can I add a venue for my events? How Can I Give Decentralized Category Permissions?